I have been working across the entire Easter weekend, have enjoyed Easter and have found time to reflect upon the reason for Easter. It is a very important time of the year and one which I fear is treated as a meaningless holiday by far too many. Over the course of the weekend, I have found Mark 9:31 to be quite meaningful and uplifting. 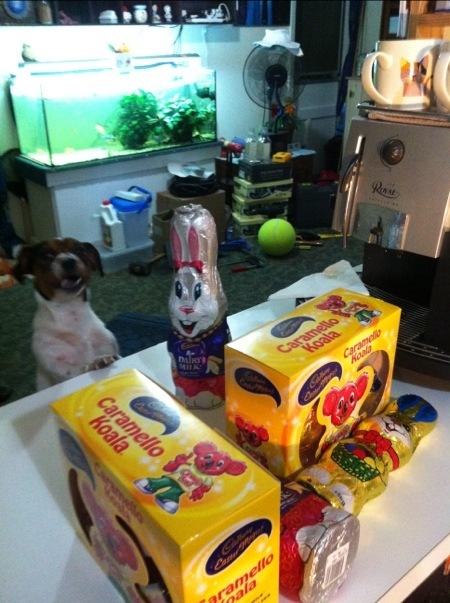 Of course Easter is a time to celebrate, and a time which excites Nattie and Pebbles due to the deliveries of the Easter Bunny. 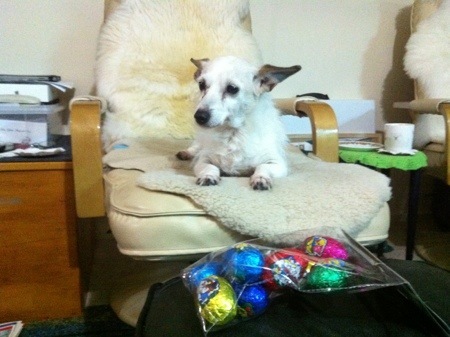 With Pebbles, Easter eggs have to be kept out of reach, lest they get carted away. 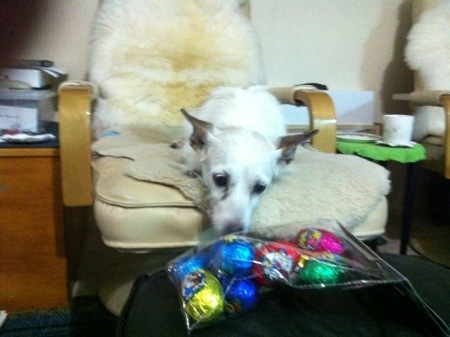 Nattie, on the other hand, has seen enough Easters to be more mature about the arrival of the eggs. One thing which I do not understand about Easter is the public holiday structure. Obviously Good Friday is very important, but the Saturday and Monday do not make as much sense, as the Sunday is the day of the resurrection. I suppose that, back when the Easter public holidays were enshrined in law, people worked on Saturday but not Sunday, so making the Saturday a public holiday made sense, and in the interests of observing the Sunday holiday for those who did not work on Saturdays, the Monday was also made a public holiday. Alas now, in the age of a 38-hour standard working week where “normal” is considered Monday to Friday work, but with a large portion of the population doing shift work at all times of the day and all days of the week, I think it would make more sense for the public holidays to be on the significant holy dates (Good Friday and Easter Sunday) with the Monday retained as a public holiday as an observance of the Sunday for the benefit of those who do not normally work on a Sunday, as well as those who are required to work on such an important day. In my view, rearranging the public holidays in such a way would, in a small way, help to reassert the importance of Easter in the minds of the population-at-large. However I hadn’t finally got around tuit ’till this morning. Coffee. I need (?) coffee to Prop Me-up (a small township near bordum; sometimes mistakenly miss-spelt ‘boredom’)…..
Was it deliberately left there, so as to distract the attention of the Monster Bunny during the early hours of this day? (well until lunchtime anyway). You do realise that if this was ever to leek out, we could be carroted to a state of ridiculous uncontrolable laughter?. 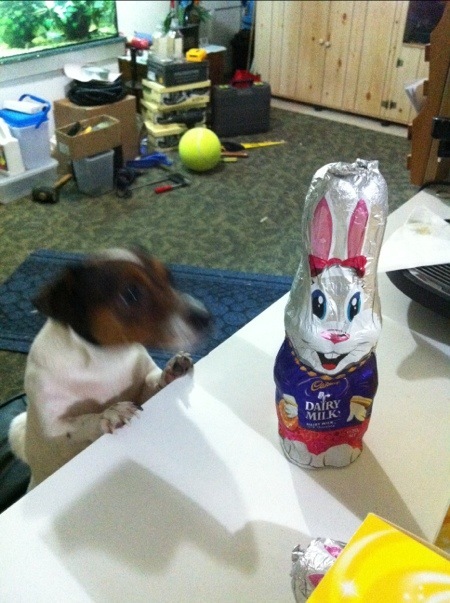 After all, Monster Bunnies this time of year abound aplenty. That’s why we made ’em their very own Highway named “Plenty”. I was wondering if anyone would notice the tennis ball and either recognise the large size of it, or get confused and think it was sitting next to a miniature tool set. Pebbles doesn’t like the big tennis ball much, but she will roll it around with her front legs for a short time if she thinks she isn’t getting enough attention with her multitude of regular-size tennis balls. 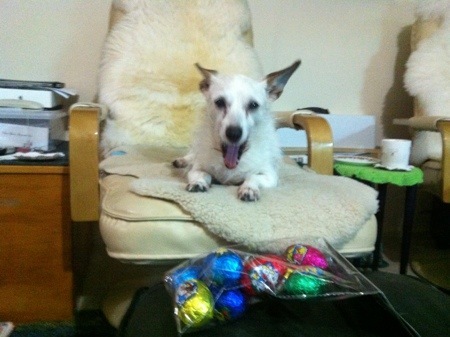 Thanks for your late Easter wishes Noel. To be fair, technically my wishes were late having been posted a little after midnight due to the WordPress iPhone app doing very strange things when I was trying to upload those photos. 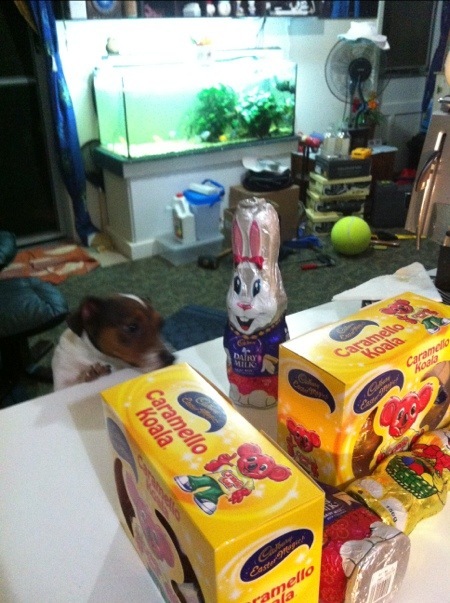 Good to the the Easter bunny was good to you. He missed me this year…. However it is an important time of year. 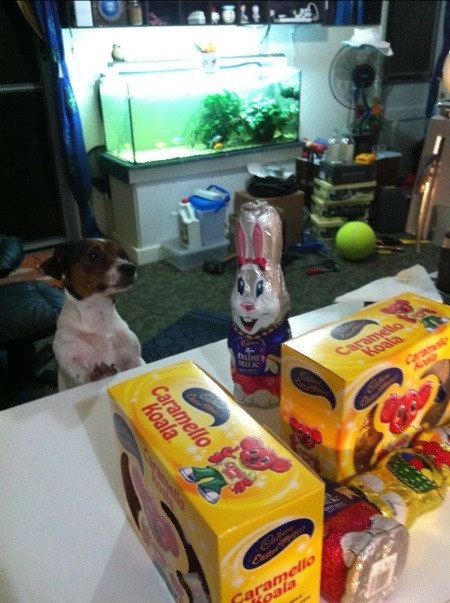 Love the picture of the dog and the eggs.